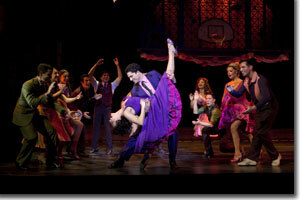 Arthur Laurents, who wrote the original book for West Side Story, puts his stamp on this unique musical, bringing more heft to the gangs. "They're murderers," he says, taking a cue from the gang violence that plagues so many of our cities. In taking this tack, Mr. Laurents provides a lot of food for thought regarding the integrity of the story, though ultimately upsetting the delicate equilibrium of the original, conceived, directed, and choreographed by Jerome Robbins. At a distance of 54 years since it opened on Broadway, we see that Robbins' sublime blend of classical ballet and muscular modern dance imbues this tragic love story with a choreographic element that is as integral to the experience as the music, the lyrics, or the story itself; in fact, in the movie posters, the dancers are the hallmark. Given that this story is an adaptation of Romeo and Juliet, it's interesting to note a couple of key differences and how these affect the emotional dynamics. First, in "Shake-speare's" version, the opposing gangs were families of the same ethnicity, with a blood vendetta; in Laurents' adaptation, one gang is Hispanic (Puerto Rican) and the other is working class Caucasians, which creates racial tensions as the basis for the feud. (Believe it or not, during the development of the book, Catholic and Jewish gangs were considered!) Second, in Shake-speare's version, both lovers take their own lives separately; while in Laurents' version, Tony (Ross Lekites) is shot and Maria (Evy Ortiz) lives. David Saint, who directed the touring production based on Laurent's Broadway revival, amplifies the racial overtones by emphasizing (through casting) the Hispanic and African heritage of the Sharks, so there is no doubt as to the basis of the feud. This is underscored by Lt. Schrank, who shows greater antipathy toward the Sharks than the Jets. The racial characteristics were enough to do the trick in the original, and would have been enough in this revival, but in Laurents' revival the Sharks originally spoke almost entirely in Spanish, making it difficult for many audiences to understand what was being said. Taking this tack with dialogue is much like doing dialects and accents as close to the real world as possible, rather than using substitution techniques for flavoring the language, while making it understandable. At its most effective, theatre is representational, not verité—art is the distillation and elevation of life, not a replay. In another questionable directorial decision, in the final scene, the tragedy is diminished by having Maria cut short her song, while she holds Tony as he expires, and arise and address the gang issues before donning the widow's veil. There's an aroma of Lisystrata in this gun-toting Maria, but the effect is to stress Maria's pain and anger, and not the tragedy of Tony's death. While the vendetta in Romeo and Juliet is certainly the root cause of the tragedy, it does not resolve itself during the climactic scene, but in the Epilogue; while in this production, West Side Story, the climax and the epilogue are mixed together, diluting the effect. Another corresponding effect of hyperbolizing the murderous intent of the gangs is to make the comic scenes (the Jets' satirical, "Gee, Officer Krupke") seem out of place. In an interview in late 2008, Laurents said, "I don't think there's any point in doing a revival unless you have a really fresh approach." This is the same mistake many directors make with Shake-speare. The upshot is, there's no point in doing an adaptation if it undermines the dynamics of the original; better to do a traditional version well, than a misguided reconception. Shake-speare's tragedies are much more difficult to adapt than his comedies and histories because of the complexity of the relationships between characters, settings, and cultures. 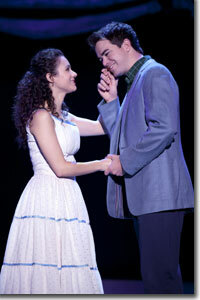 While we appreciate what Laurents tried to do, one of the most touching scenes in his version is Tony and Maria's escape to a dream world where they sing "Somewhere"—against a plain backdrop very close to the simplicity of the original 1957 Broadway production. These conceptual issues aside, the cast is stellar throughout. Ortiz exudes the youthful exuberance and idealism of Maria, while Lekites embodies Tony's maturity relative to the other gang members. On the occasions when Ortiz lets loose with her soprano, the results are dazzling. Though more measured, Lekites range is impressive, moving from the robust to the delicate. The two have great chemistry! Michelle Aravena is strong and sassy as Anita, busting out on "America," and her scenes with German Santiago (Bernardo) are hot. Drew Foster's Riff is the king of cool. And did we mention that the score (Leonard Bernstein) and lyrics (Stephen Sondheim) are as good as it gets? 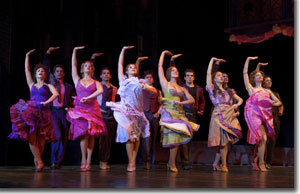 Denver Center Attractions presentation of West Side Story runs through January 1st. 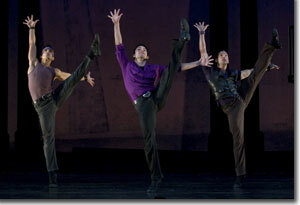 For tickets: 303-893-4100 or www.denvercenter.org.